Another entry in popular series of sport games, in which we meet characters from the most famous franchises of Nintendo and SEGA companies. 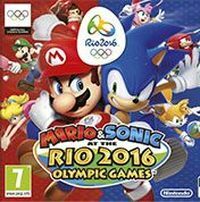 Mario & Sonic at the Rio 2016 Olympic Games for WiiU and 3DS is another entry in a quite popular series of sport game published on occasion of Olympic Games since 2007’s release Mario & Sonic at the Olympic Games for summer Olympic Games in Beijing. This time, developers prepared the game for summer Olympics in Rio de Janeiro for both Wii U and 3DS consoles, with some small differences between them (for example, a “big” edition lacks golf). As usual, we take part in various sport competitions while playing as characters from franchises of Nintendo and SEGA companies. The first side is represented by e.g. Mario, Luigi, Princess Peach, Yoshi, Bowser and Donkey Kong. On the other team, we will meet Sonic The Hedgehog, Miles “Tails” Prower, Shadow The Hedgehog, Dr. Eggman Knuckles The Echidna and others. We can compete in such disciplines as football, volleyball, ping pong, gymnastics, cross-country or rugby. Quite obviously, production offers both single and multiplayer mode. Three-dimensional visuals are set in style familiar to all Nintendo’s fans. In other words, the game looks colorful and joyful.